The Force is growing stronger with “Star Wars: The Force Awakens” moving toward a new opening weekend record of at least $225 million in the U.S., estimates showed late Friday evening. The updated estimate from Disney places the seventh Star Wars movie more than $16 million ahead of the six-month-old record by Universal’s “Jurassic World,” which opened at $208.4 million on the June 12-14 weekend. And in a sign indicating the movie will have an especially long run at multiplexes, opening day audiences have given “The Force Awakens” an A CinemaScore — including an A+ grade among women and A+ scores with audiences under 18 and under 25. A total of 98% of audiences gave the film an A or B. “The Force Awakens” started screening at 7 p.m. on Thursday with hundreds of sellouts. Rival studios had been projecting an opening weekend around $250 million since mid-Friday, but Disney opted for a cautious outlook, asserting in the early afternoon that the movie would top $200 million, then pushing that to $215 million in the late afternoon and raising it to $225 million-plus in the late evening. “The Force Awakens” started its U.S. box office run in record-setting fashion with $57 million in Thursday night previews — 31% above the $43.5 million in previews for the final Harry Potter film. The previews are part of the Friday total. The film is playing at a total of 4,134 North American locations. 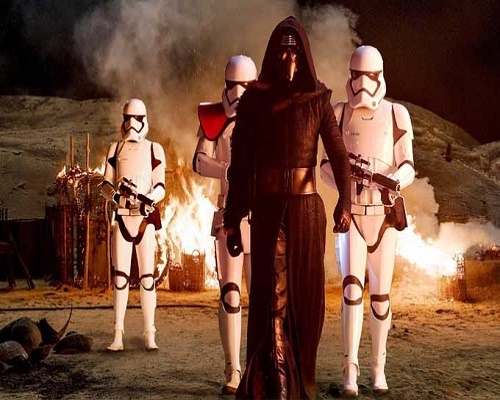 Rival studios had forecasted prior to the opening that “The Force Awakens” would open with at least $210 million. Disney also reported Friday that “The Force Awakens” had grossed $72.7 million in two days from 44 international markets with the U.K., Germany, Sweden and Norway generating single-day records. The film, which carries a production cost of at least $200 million, opened in nearly all other foreign markets Friday. “The Force Awakens” could also eclipse the international opening weekend record of $316.1 million by “Jurassic World” — along with the dinosaur movie’s worldwide opening record of $524.9 million. “The Force Awakens,” directed by J.J. Abrams, stars Daisy Ridley and John Boyega in the key roles as Rey and Finn along with original “Star Wars” stars Harrison Ford as Han Solo, Mark Hamill as Luke Skywalker and Carrie Fisher as General Leia. The seventh Star Wars movie will take in about 15 times as each of the two other openers — Universal’s Tina Fey-Amy Poehler comedy “Sisters” and Fox’s “Alvin and the Chipmunks: The Road Chip.” “Sisters” should gross $15 million to $17 million at 2,961 North American theaters and the fourth installment in the Alvin series should make $14 million to $16 million from 3,653 locations.